Using data from Google News, we have found that while the total amount of reporting on climate change is decreasing, the proportion of those stories that mention migration is increasing. Read on to find out why. Statistics are a notoriously controversial topic when it comes to migration and climate change. The very idea of defining a “climate migrant” and then counting their numbers is fraught with problems. However, data on the public’s interest in migration and climate change is surprisingly easy to find, and even visualise. With freely available data we can begin to answer questions like: have the public been searching the internet for information about migration and climate change more? Are journalists writing about climate induced displacement more or less in the last 5 years? One quick caveat. We’re using a lot of phrases that we know are controversial such as “climate refugee” and “climate migrant”. While acknowledging that these phrases are a contested, the frequency with which they are used online is a useful benchmark of public interest. The Google News service allows searches within a date range. This means we can compare year by year how many news stories are written about climate change and migration. This graph shows news stories that contain the world “climate” and any one of the words “migration”, “displacement” or “refugee”. This shows us several interesting things. First, a lot more is being written about the topic in the last few years. This is also a graph the number of articles that are specifically about migration and climate change. The key words are in the title of the article, not just anywhere in the text. 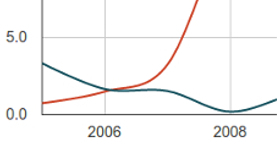 However, between 2004 and 2015 there is also a lot more online news and blogging. So while more is being written about migration and climate change, more is also being written about every other topic. We don’t know whether the proportion of stories on migration and climate change has increased or decreased. But we can look at how much of the climate change coverage was about climate change and migration. This graph shows two things. In red is the total number of news items about climate change. This seems to have peaked and gone into decline. The blue columns show the number of climate change news items that also mention migration (or displacement or refugees). So although the total amount of climate change coverage is declining, the percentage of it that mentions migration is increasing. Why is this? The total amount of climate change reporting has declined over the past 5 years. After the hope and then disappointment of the Copenhagen climate talks, climate change became less of a story. At the same time, when journalists are writing about climate change they are now far more likely to write about migration and displacement linked to climate change. Perhaps there is a need to produce more compelling and dramatic stories. Whether this produces helpful or unhelpful news stories is another question. What does this tell us? Journalists and editors are less willing to write (or commission) stories on climate change. They must believe (rightly or wrongly) that the public are less interested in climate change. They probably also see that migration has become a deeply controversial media topic – an issue that the public want to read about. So in recent years, writers have used migration as a way of adding a new and controversial angle to their climate change reporting. These stark changes in media reporting do not seem to have have had an affect on the public interest in migration and climate change. Or public interest in the issue does not seem to be the driving force behind the changes in media reporting. This shows how often people have searched for phrases relating to climate change and migration. It gives some insight into public fascination with the topic as it shows how frequently people spontaneously look for information on these subjects. While searches for each phrase vary significantly, they no not follow the same pattern as the media reporting. 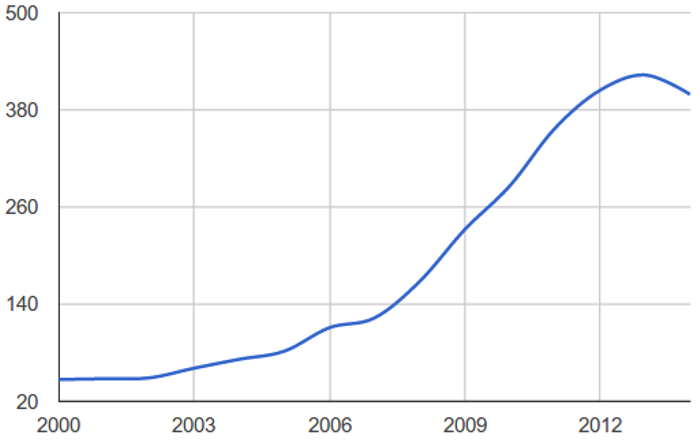 This graph shows the number of academic journal articles published on migration and climate change every year. The data comes from Google Scholar that archives academic articles. The graph shows a steady increase in interest, with perhaps a slight decline during 2014. We will have to wait until the end of 2015 to see if this decline continues. The graph does show a growing and significant interest in the issue within the research community, which is positive. The key issue here is the changing media coverage – with less coverage about climate change in general, but more of that coverage about migration. If journalists are increasingly framing climate change as a migration issue, it is increasingly important to make sure these stories are accurate. It also becomes more important to encourage journalists to consider how they portray migrants and refugees in their reporting, and the impact this can have on the people they are reporting about. Alex Randall coordinates the UK Climate Change and Migration Coalition. He is author several reports on migration and climate change. He writes regularly on migration, displacement and climate change for a number of outlets.